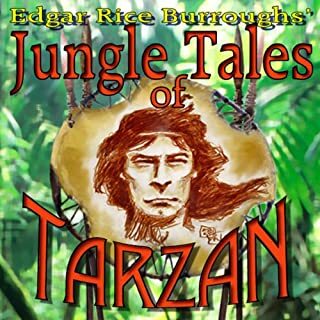 The Jungle Tales of Tarzan, book six of the Tarzan series, consists of 12 short stories loosely connected to each other, although each one can stand on its own. They fill in many details of Tarzan's youth and adolescence in the jungle, while still living with the tribe of great apes that reared him. Mr. Burroughs, much like Gene Roddenberry half a century later, was able to make very trenchant comments on our life and society by setting his stories outside our normal recognizable world. "A Princess of Mars" (1912) is a science fantasy novel by Edgar Rice Burroughs, the first of his Barsoom series. Full of swordplay and daring feats, the novel is considered a classic example of 20th century pulp fiction. It is also a seminal instance of the planetary romance, a sub-genre of science fantasy that became highly popular in the decades following its publication. Its early chapters also contain elements of the Western. The story is set on Mars, imagined as a dying planet with a harsh desert environment. This Annotated Omnibus Edition contains the first three novels of Edgar Rice Burroughs' Martian tales (the Barsoom series). The first of these novels, A Princess of Mars, was Burroughs' first book, and he wrote the next two novels in quick succession. Together they tell the story of John Carter of Mars - how he came to Mars, met the love of his life, and quickly found himself occupied full-time defending her and saving his adopted planet from interplanetary evildoers. This trilogy opened the doors of popular science fiction to an entire nation and world. It launched the original pulp science fiction storyworld and series, often imitated but never duplicated, and has inspired four generations of young sci-fi and fantasy writers, artists, moviemakers and videogame designers. And, of course, it's a ripping great story. This Pulp-Lit Press Annotated Omnibus Edition takes those three novels together as a coherent story. Each is gracefully and unobtrusively annotated, to help the modern reader put it in the proper literary and historical context for maximum reading enjoyment. All annotations are presented together in a single chapter, easily skipped by readers who prefer to get on with the story. 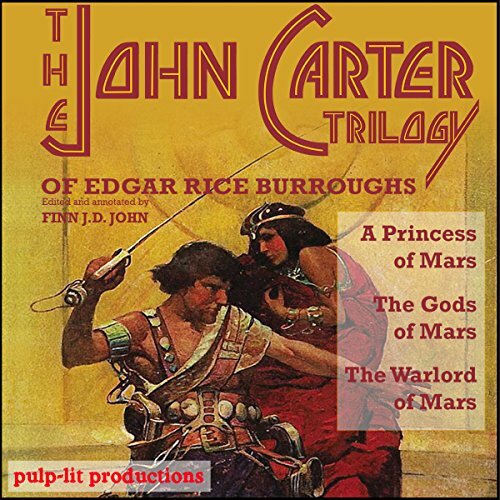 If you could sum up The John Carter Trilogy of Edgar Rice Burroughs in three words, what would they be? What was one of the most memorable moments of The John Carter Trilogy of Edgar Rice Burroughs? While the story was fun, the commentary (written by the reader), was even better. Enjoyably written and made everything deeper. Which character – as performed by Finn J.D. John – was your favorite? Dejah Thoris. There's a delightful sincerity to the performance. It's clear that Dejah made the reader's heart flutter as a young man reading these stories for the first time just as she makes John Carter's in the novel. If nothing else, just share the reader's initial forward with anyone interested in story. It makes for a great listen, even without the rest of the book. Excellent story read to you, not acted out. I have read the books by Edgar Rice Burroughs several times. The series is read by an editor and fan - Finn J.D. John. Several other audible reviews found fault with Finn reading the book, not offering different voices for every character. Having read these books before, however, this did not decrease my enjoyment of the stories. It allowed the stories to move along at a faster pace, which I appreciated. It did not detract from the excellent dialogue and vivid scenes created in Burrough's original works. So, if you want these amazing imaginative stories acted out for you, buy another performance. For the price, I really enjoyed Finn's reading of these three classics. A fun, albeit campy read. Chivalry. Helpless damsels in distress. Six limbed space monsters. Swashbuckling. Steampunk style airships. What fun! The early 20th century ideals in the book may be a little foreign, and definitely outdated to the modern reader, but that's what we're looking for in pulp sci-fi, isn't it? That's part of the charm. The annotations are very well done, and helpful in reminding the reader of the era in which the book was written. It is also very evident, from the very beginning, that these stories have had a major impact on many of our more modern science fiction books and movies . Overall, the stories were interesting and well written. The narrator did a fine job, and was pleasing to listen to. Would recommend. I agree with Robert's review: Finn J. D. John's introductory commentary is worth a credit in itself. Both his writing and the way he reads it are irresistible. As for his performance of the text of Burroughs' novels, the experience is certainly not like hearing John Carter himself speak, but it is like hearing John Carter's words read in the warm, affable, expressive tones of a favorite uncle. Except, that is, for spoken dialogue: Mr. John's attempts at individual voice-characterizations, even in dialogue for Carter, range from barely adequate to acutely embarrassing. But even with that limitation, this is one of the best audio versions of Burroughs' initial Martian trilogy, and the only one to give you all three volumes for a single credit. the 1st two books were good the 3rd one was ok.But it was a good way to end the series. over all i enjoyed the series. If you're new to Burroughs' Mars series you're in for a treat. This trilogy was the inspiration for the majority of what we know as modern Science Fiction, especially Star Wars. Some scenes certainly show their age, but overall John Carter still holds up surprising well. As for the annotations, I personally enjoyed them. They don't detract from the story at all, they're at the end of each book, and provide a great deal of background to Burroughs and his time. The narrator honestly isn't great, but consider that a minor imperfection. Highly recommended. Have you listened to any of Finn J.D. John’s other performances before? How does this one compare? Yes. This one is better. But in the other one, he starts reading the book right away. I really only have one complaint and it's not unique to this book. The commentary gets in the way. 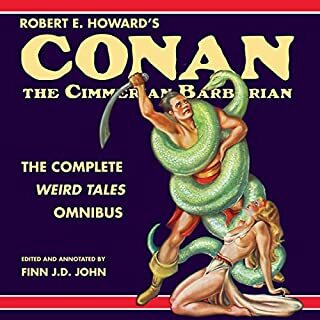 I bought this book for the story, that's what I'm interested in, I don't know about you but I don't buy old-time adventure pulp novels for literary critical analysis. But like lots of similar books, this one makes you wade through a bunch of commentary before it gets down to the story. If you, like me, just want to get down to the story, it's pretty easy to do. Just start listening with Chapter 5 instead of Chapter 1. Then you can listen to the end of the first book, skip the chapter of "annotations," and continue with the second book, and so on. 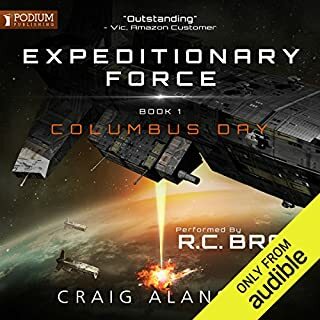 I like the narrator's voice and style, it's very comfortable to listen to and smooth, he doesn't call attention to himself so you can just soak up the story. And the John Carter of Mars stories are just classics, no issue there. Anyway, once I got past the litsy-critsy chapters, I enjoyed this book a lot. I would have given it a much better rating if the publisher had (hint hint) PUT ALL THAT STUFF AT THE END OF THE BOOK!!!! Or at least told me at the very beginning how I could easily skip over it. Luckily, I'm here to do that for them. 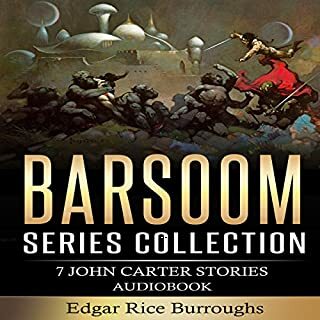 I ended up really liking the John Carter Barsoom series. In fact, I bought the stand alone first book, and picked up this trilogy to fill out the remainder of the series. The world that Edgar Rice Burroughs sets up in really fantastic and different from what is currently being imagined. 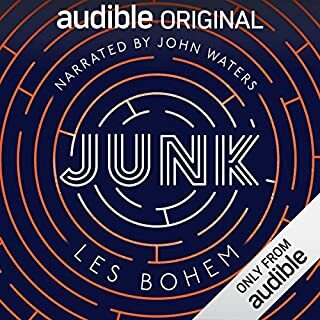 A very fun listen/read. Another nice feature of this edition is the commentary about the book. It covers both Literary criticism of the way the book is written, and commentary about what the book is saying, and whether E.R.B is racist or not. As with most science fiction, the story reflects issues of modern society, by way of fantasy. A very nice addition to the book. The reading is good, but not especially dramatic. I had already gotten used to the other book's reader, but the performance is not a hindrance to listening. the annotations are great, well worth the Credit. You can tell the Narrator has a love for the series and does an excellent job. loved it, a great story learning about different cultures overcoming evil darkness and the ability two travel between two worlds, very exciting! !!! At the end of each book you are treated to a short lesson that gives a outlines many of the historical references that would be completely lost today to a modern reader. Great Story. Absolutely awful narration. Someone needs to tell the guy to slow down! It was like he was racing to spill it all out at once. I couldn't even do books 2 and 3 because I found it so hard. I'll definitely be putting a claim in for a return because it was so unenjoyable. 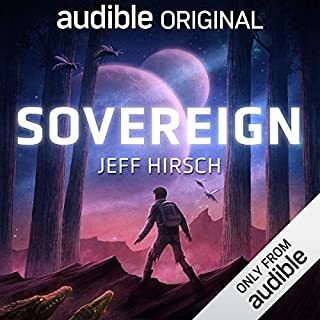 the only downside to this audiobook is the pathetic chapters of modern day uncalled for social justice vomit preceding and following each book, quite blatantly put in place to decide for you your opinions on the work you paid for. Strongly advise skipping said chapters and deciding for yourself!